Back in late 2007, at about the same time as I was starting to think about saving hard and investing wisely, I seriously considered buying a home in London. We were still planning to live well below our means and not be greedy but even so the small home we found would have still resulted in a big mortgage. As I do with everything I did my own research and came to the conclusion that property in London was overvalued. 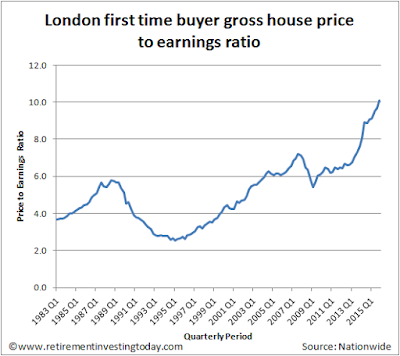 It was charts like the below that gave me that view, with at the time London first time buyer house price to earnings ratio’s having averaged 4.4 since 1983, while they were now at record highs of 7.1. So as the type of person who tries to avoid buying anything that is overpriced I signed another Assured Shorthold Tenancy Agreement (AST) for our compact flat and we waited it out. Roll forward to today and we can see what has happened to London house prices since that fateful period. By the time prices started to rise again in early 2009 I still didn’t see value, after all they were still 5.4 times earnings, and my FIRE journey was advancing nicely with wealth of a bit over £200,000. The flat we were in was a new build, although clearly built by the lowest bidder so not one you’d want to own yourself for the long term, but everything worked, it was well insulated meaning heating bills were negligible and we were having reasonable success keeping rent increases modest. We decided to batten down the hatches and just push on for FIRE. Meanwhile, house prices in the big smoke headed off to the moon. Buy in December 2007 and sell in December 2015. After multiple viewings the home we found was a small terrace which at the time was priced at £250,000 which was higher than the value of the flat we were renting. Deposit of 10% of house value. I would have taken the lowest 2 year fixed teaser rate and so remortgaged bi-annually. Proxy interest rate used is the Bank of England’s monthly interest rate of UK monetary financial institutions (excl. Central Bank) sterling 2 year (75% LTV) fixed rate mortgage to households (in percent) not seasonally adjusted used. I know I would have initially had a 90% LTV but its close enough for this analysis. Mortgage period of 20 years. Fees include solicitors fees, building inspection, agents fees, mortgage fees and energy performance certificate (EPC) costs. Maintenance costs of 0.5% per annum. I know my first rental agreement and I know my last. Extrapolate in between as too lazy to dig out each AST. Return on investment equals my actual annualised return. Amount available for investment is the sum of annual home owning costs, initial deposit, principle repaid and interest charged minus rent paid. In hindsight I have lost out significantly to the tune of £94,635 even though over that period London House Prices have ‘only’ increased by an annualised 5.2% compared with my Investing Wisely strategy at 5.7%. The main reason for this is of course Leverage or Gearing and if house prices had fallen we’d be having a very different discussion. If I had have stepped up, leveraged up, treated it like a geared investment not a home and sold to the greater fool today (as the market is now just silly from a valuation perspective, again IMHO) I could have added that £94,635 to my current wealth of £911,000 and I would have had a little over a £1 million. I’d be FIRE’d and sunning myself now instead of working one more year. Hindsight is a wonderful thing. Best not look. We tend to feel our perceived regrets harder than we feel our successes. 1) More 'attached' to it than your current rented dwelling. 2) Have less money as you may have spent on renovation, expansion, decoration, garden (? ), etc. Would there have been any council tax differences? What amazes me the most about houses is the manner in which we buy them. When we buy a car, at least we give it a test drive and, should anything major go wrong early on, we probably have some kind of cover. When we buy a house, probably the most expensive single thing any of us ever spend money on, we do not even get to spend 24hrs in it before buying. For those of us not in the trade, it is usually a behemoth gamble that has to be made relatively quickly. The survey most people go for is invariably a joke (e.g. 'could not check as it would have meant moving furniture'). I am also surprised that high street estate agents still exist and it is not all web based. Take these examples as solice perhaps. A friend of mine bought a house. The surveyor missed the fact that it had single brick thickness walls. They found this out when they wanted to make some changes. Their mortgage was now at risk and they could not re-mortgage. They have had to spend £100k (more possibly) rebuilding the walls. But it was not just the cost of the repairs; they had to move everything out and live elsewhere and their 'home' was disrupted for a long time. They looked into sueing the surveyor but he was now bancrupt and had no cover at the time he surveyed their house. Another house up the road from me has also required about £75k spending on it due to bad building work which was not expected when purchased. "Hindsight is a wonderful thing. Best not look." You're of course 100% right. The reason I do is that I've made plenty of very good decisions by going 100% DIY when it comes to personal finance but I've also made some doozies. Not understanding contango and getting caught out by high investment expenses early on certainly spring to mind. By looking back over past decisions I hopefully will make better ones going forward. "Would there have been any council tax differences?" I'm not actually sure but if there was it would have I suspect only been one band different so in the scheme of things negligible when compared to £95,000. As an aside best not to look comment has given me another thought. So many PF blogs these days only publish the "everything is smelling of roses" side. Wonderful international holidays, I'm making no sacrifices and it's all so perfect. Maybe it's just me but my FIRE journey (and for that matter my pre-FIRE days) hasn't been anything like that. Don't get me wrong I wouldn't change anything I've done for a second but at least by publishing both the glass half empty as well as glass half full stories hopefully readers get to see a more balanced view. Absolutely. I certainly appreciate your attempt to be objective as, I am sure, do others. RIT - may I suggest keeping a diary of your thoughts / predictions as a remedy to suffering from the Hindsight Bias. Re: optimistic FIRE sites. You're spot on - it's referred to as Survivourship Bias / Silence Evidence / (Taleb's) Cemetery of Letters. In a nutshell - only the FIRE blogs get written and read - the FIRE failures are confined to the Cemetery of Silent Witnesses, and nobody knows how many there are! The opening line to Sinatra's 'My Way'springs to mind! I guess there will be many people who have lost out on the London property boom in recent years so you are probably in good company. You intersperse the article with 'I' and 'we' - I assume this was a joint decision so 'you' lose out on £45K? Enjoy the run-in to FI over the coming year. I am looking forward to see how the next stage develops - good luck with it! I'll just clarify the 'I' and 'we' thing. When it comes to family decisions both my better half and I make joint decisions. For example which town and country will we FIRE to is a joint decision. When it comes to the financial side of things for reasons I won't go into I have responsibility for the basic cost of family living (rent, food, council tax and most joint 'fun') as well as my own 'fun'. So 'I' wouldn't have lost £95,000 but 'we' would be living in a home rather than renting. My better half has responsibility for her own 'fun' only. Based on this financial relationship we should also have no problem FIRE'ing together. Not conventional but it works well for us. "Lose" out to what? These are relative terms. People who are "winners" are they all happy? Seems they don't suffer from diseases, long job and commute hours, affected by storms etc. Life is not about comparing everything. I lived with my parents in India until 21 years of age and my Indian house was around £2000 (2 lakh rupees). They both worked whole life and still they don't have saving of £20000 combined. They never flew in flight and gone for holidays out of India. I bet you must be richer then them. Are they happy and healthy? Absolutely. Reason?. Ignorance is a bliss. There are probably 500 million (8 times UK population) in India lives in abject poverty, earning probably less than £5 a day. Now do you feel rich? You should. @RetirementInvesting, relax and live for today. How I saved 95k and gave my kids a future. Would be interested to know where you went and why you chose that location? We're still to lock in our Med destination. We will make one final exploration visit in the late autumn which should hopefully set the (at least initial) destination. Your point about test drives for property: perhaps one could rent a property of roughly the style and location desired, and then see if the owner would sell to his tenants. It might take a few goes before one were lucky, but that would also solve the market-timing problem: buy the first time a landlord says "yes". - A lot of BTL'ers won't want to realise the capital gains and the tax that goes with that. CGT still 18% and 28% even after the recent budget. - This is the major one IMHO. I know quite a few renters including myself and at my end of the market the quality of the rental stock is dire. I'll use my example. I've been in my flat for 10 years and I'd suggest that the landlord has spent less than £50 on maintenance. They'll fix the bare minimum to keep the place 'running', but no extra, so if you wanted to turn the place into a home you'd need to invest a lot of hours and money to catch up on the maintenance that should have happened. My place was clearly built by the lowest bidder and I must say when I eventually leave I won't look back and think gee I wish I could have bought that. "A lot of BTL'ers won't want to realise the capital gains and the tax that goes with that." What is their alternative: hold the property until they die? My wife and I have separately lived in Edinburgh flats that we'd have bought like a shot had we been able to afford it. I've also lived in a couple of places that I wouldn't have touched. That's the point of test-driving, surely. "What is their alternative: hold the property until they die?" Yes, effectively a pension annuity with something to pass on to the next generation tax free. Have you read the latest Merryn Somerset Webb article in the FT (should be a free link, if not google Wait until 2019 if you want a buy-to-let property)? Many more than ten years ago, alas. But presumably if the prices of flats have risen, so have the rents. If so, the point about test-driving still stands. I thought Merryn's argument very plausible. I'm struck by how many posters at MSE clearly haven't absorbed what's about to happen to BTLers. I'm in my mid 50's. I've been FI for the last 10 years. Like most people I made some very costly errors - (all of them learning opportunities). I tend to think that I'm experienced and wise enough not to make any more significant ones. Thank you for the response RIT, much appreciated. Absolutely no problem. It was a great question, something I should have checked myself anyway and one that couldn't be answered with a short comment. As others have said - the renting gives you the freedom. I did very well buying (what I thought was an overly priced) flat in London 15 years ago, and we upgraded a couple of years ago. The downside is its impossible for me to save as much as I would like because of the large mortgage, but to get FI in another 10 years I need to not only hammer my savings but also the mortgage. The numbers look like its not realistic so I have to hope the overpayments will help me rapidly catch up but its going to be a challenge! I will be intrigued to see where you end up - assume you will still leave your accounts UK based but live in the Med somewhere? "The numbers look like its not realistic so I have to hope the overpayments will help me rapidly catch up but its going to be a challenge!" I'm sure you saw my previous post? Just make sure you start and stay determined London Rob... Just about every assumption I made was wrong and it/s still turned/turning out better than ok.
"...assume you will still leave your accounts UK based but live in the Med somewhere?" That's definitely the plan. Countries like Spain and Cyprus don't have the best record when it comes to financial stability. We'll bring into our new country enough for a years worth of expenses or so at a time only. The main challenge is going to be the eventual home purchase. We will be needing to bring in EUR350-400k plus stamp duties for a few days to complete. I haven't figured out how to deal with that yet but I'm sure I'm not the only one with the problem so there must be a solution out there. If we were buying off returning Brits then we might be able to do the exchange in £'s offshore but otherwise no ideas yet. Will also have to see what falls out for each Med country if we Brexit. That might also require a bit of a rethink... Although for my family situation even worst cases don't seem insurmountable as I'm sure our countries of choice will still want our money. What %age would houses now have to crash by for your speculative 2007 decision look smart? FIRE stands for financially independent retired early. To wash my face financially they'd have to fall 26%. By the way, my own cash flow spreadsheet (very similar to yours) shows that by not buying a flat in London, that I was interested in for £270k in January 2007 (it sold for that figure), which sold again for £465k a few months ago, has resulted in a lower overall equity value of £190k. I thought the flat was overvalued in 2007, and interestingly all of that extra equity results from the HPI, which shows that without capital gains, often renting is better than buying financially speaking. But of course, we did have HPI and I'm £190k worse off for that decision. Which actually means that my future productivity to the value of £190k goes to someone who did buy back then. Looks like great minds have thought alike. My choice and yours have both resulted in 50% less wealth than we could have otherwise had. I guess that shouldn't be a surprise given the similarities to both our decisions. Yes. As I say, I will probably live in London for the next 10 years, so I had to eventually face the decision head on and when I did a proper cash flow spreadsheet I worked out that buying was a lot safer than I'd imagined, if I did it correctly. I bought a 3 bed semi-detached in a fairly working class area of London for £360k in 2014. My mortgage payments are £1150 pm. My rent for the same property (I compare like for like) would be £1500pm (the LHA sets the floor with average payment of £1146 in our area). I lose all the potential capital gains and dividends from my deposit but my outgoings are less pa and I benefit from any HPI. My strategy was to swallow my pride and not live where I thought I "deserved" to live but to buy a value house in a cheap area. I also took lodgers immediately and while interest rates are low I don't overpay the mortgage. Accounting for all costs, maintenance, etc, since 2014, and comparing to hypothetical rental scenario my on paper equity is just short of £25k up. In other words, if I sold up now, minus the EA fees, I'd have £25k more than had I rented. But, as I say, unlike you, I am only just setting out on my 'in earnest' FIRE journey and plan to live in this house for a number of years to come. So any ups and downs between now and the future are irrelevant to me. I wish you much success with your choices mwpt. I think one thing in the past few years that has prevented me from jumping in has been my rapid progress to FIRE which has just opened the world up for me. Buying something in London has just not even entered my mind. Looking back at my posts seems to corroborate that. Other than my annual valuing the property market at county level post I haven't compared value and affordability since October 2013. I see all the above as being about making decisions - and living with the consequences. and attitude to -- RISK . You have both benefitted by having larger sums to invest - have therefore made some more mistakes with your investing strategy and choices - which you will have learnt from - and hopefully will not be making these sort of mistakes again . But you will make other mistakes in the future - which you will also learn from - and you'll have some winners too - which will overrall outweigh the losers . I don't hold out much hope for anonymous 3rd April@ 07:48 who seems to think he has made all his significant mistakes already and won't be making anymore . Well - good luck to you Mr or Mrs Anonymous. Agree with this. To note, see my above reply to RIT, I took the decision in 2014 to take the risk and buy. Properly constructed cash flow and risk spreadsheets eventually convinced me the decision could be less risky than I'd previously imagined. 100% agree. I backed a horse which came in second and not for one second am I bitter and twisted about it. It was a mistake, of which I've shared plenty here on RIT.com and I'm sure over the next 40 or so years I'll make plenty more. Like another commenter below, I don't agree with you that it was a mistake. It was a thoughtful decision based on an assessment that prices were too high. Prices have gone even higher since then, but that doesn't mean your original assessment was wrong. If prices are too high then they will eventually correct. They haven't yet, but again that doesn't mean your original assessment was wrong. Your decision not to buy was no more a mistake than a decision not to bet a substantial sum on England to beat Germany. Both decisions result in you having less money in the end, but I don't think either could be described as a bad decision since the eventual outcomes in both cases were highly uncertain. The most surprising is that almost all London house/flat owners believe that house prices will be growing at least 5% per year forever. I have been trying to make a point that the growth for the last 10 years is often result of lower interest rates and BTL purchases. Thus, it created a bubble. The yield of London flat rent is like 3% now. This is very risky to buy property with such prices. In my area rents stayed the same for 10 years now for river front flats. I'm 100% with you K. I am just gob smacked at both current London prices and price to earnings ratio's but I thought they were bad back in 2007 so what do I know. - am so glad that I started my FIRE journey back in 2007. PS My house was valued in 2007 - and again in 2013 ( albeit by a different agent ) - the values were very much the same. My calculations suggest that this indicates a 25% "loss " allowing for RPI inflation. But I have had the benefit of living in the house all this time - and we still haven't moved. I think the majority of the insanity is a London and Home Counties situation. Certainly, that's what my last PE county analysis showed and I think it's become worse since then. Will be interesting to see if the latest government initiatives (Clause 24, extra 3% stamp duty) and Basel 3 requirements will temper that. When we've had a look at places like Herefordshire and Shropshire as possible FIRE counties you of course get a lot less than in say The Med but an order of magnitude more than London and surrounds. Thinking some more about what you see as a poor decision leading to a loss ( albeit theoretical ) of £ 95 K - I think you are way off the mark in true money terms. Maybe you could show your calculations on real money values of the house you did not buy in Dec 07 with what it might have been worth on selling in Dec 2015. Adjusting for CPI or RPI will make a big difference . Then - to make a fair comparison - you need to consider what you did with the money instead of buying the house . So the deposit and fees presumably went straight into the market ( or were already there ) - then calculate what investing on a regular monthly basis the same amount as you would have paid into your mortgage - again into the market. Adjust this figure for CPI/RPI - and the effects of pound/cost averaging ( particularly considering the significant market falls after 2007 )- and compounding of retained dividends ( ? using accumulation units ) might end up with a fairly similar sum to your supposed £ 95 K loss. I think you have allowed rather more emotion to get in the way of a true factual illustration - which is most unlike you !! I don't think you have understood the workings correctly. I have a similar spreadsheet which shows my paper loss, so feel free to (nicely) critique it. The following cash flow spreadsheet shows my paper loss over 10 years by not buying a flat I had my eye on in Wimbledon in 2007. Let us accept that I wish to own this flat and in scenario 1 I choose to carry on renting from 2007 and invest the deposit, then buy the flat in 2016. In scenario 2 I buy the flat in 2007, then in 2016 I extract equity by remortgaging. In scenario 2 I end up with a pile more cash than scenario 1, and with the exact same amount of debt and monthly mortgage payments. This shows how paper losses / gains on property are actually real. Note that I have made assumptions on this. I assumed I took a 5 year fix at around 6% on the flat then saw my mortgage rate fall after that, so I put an average of 4% mortgage rate over the period just for simplicity. I set HPI at the exact % required which compounded resulted in the flat being worth the value it recently re-sold for (I watch rightmove). The rent figures were the exact rent figures for the time period, I rented in Wimbledon at the time and was paying £1150 to flat share with another person. Rents have gone up to about £1500 during that period. The purple line is now (2016), whereas year 1 was back in 2007. Note: I add in a disposable compensation figure as it allows the sheet to sum up cash flows. This figure is not at all accurate, it is just the max out of either rented or buy outgoings pa, it's just there as a normalisation. It's exactly for reasons like this that I go back time and again to Taleb's monumental tombs. Never confuse the right decision with the right outcome - the two are distinct. You made an informed decision at the time - fate doesn't mean that your decision was the wrong one. Sorry - my penultimate sentence is not clear . What I meant was that the non-house purchase scenario would end up with a value not looking that different from the estimated end value of the house on sale in Dec 2015. I don't think you have " lost " £ 95 K at all ! You thought 7x median multiple was overpriced, and here we are at 10x. I have to wonder how high it can go? Is there a ceiling? I note that HK is at a median multiple of 17x. Will we see 15x or more in London? It seems something has to give.. I have a flat in London - I'm looking at the market now and I'm starting to wonder if I should sell it and "bank" the profits, over the years the flat has double in value and I'd have a very large cash amount if I sold. The issue is the rent has always been about the same and it's current price-to-rent yield is 3% - It was originally 5%. If I tried to increase the rent to get it to 5% now, no one would rent it, the price and rental income have become completely detached. The problem is I obviously want to keep the property for as long as I can to enjoy the capital gain. But I am seriously questioning how much longer can this go on for, is it reasonable to expect that people can rent £500k flats for £15k a year? Will there be a price correction or, will wages and rent go up to match the increased price (probably unlikely)? Looking at the data it suggest there's a storm coming, but the market manipulation from the government seems to be supplying one big umbrella! The rent isn't going up precisely because the flat's value is. The alternative to renting is buying. Buying looks better so if people can afford to pay more they pay it to buy. When buying starts to look worse (eg because house prices are falling) expect rents to go up. How much longer can this go on? Someone above said HK was at 17x median income and London's at 10x. So still quite a long way to run up, maybe.